The dahlia is a flower that we love to grow and give during summertime. Its beautiful shape reminds us of a shining sun and its colors are cheerful and bright, which is perfect when we want something to perk up our garden or our home – or flowers to bring joy to a friend or family member. To celebrate the dahlia and the impending arrival of summer, we’ve put together a list of some facts, figures, and trivia about the lovely bloom. Enjoy! And, enjoy bringing dahlias into your life this summer! Dahlias make a bold statement in a garden or bouquet, thanks to their pom-pom shape and bright hues. 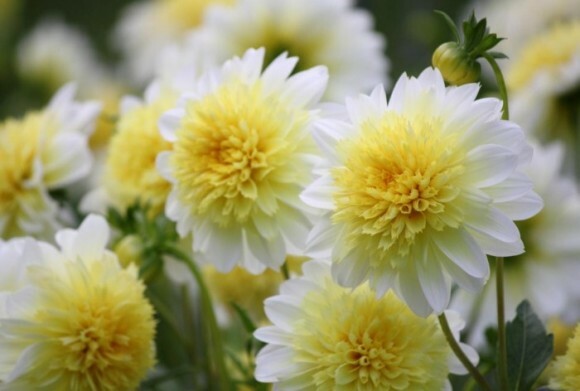 There are large and small varieties of dahlias, all easily grown and most easily found. Some of the favorite dahlia varietals include “Fidalgo Julie” and “Alloway Candy. Dahlia plants product prolific flowers during all of summer and well into fall. In mild climates, you might find dahlias blooming as early as June. Cutting dahlias encourages the plant to bloom more abundantly. Dahlia foliage is excellent for accenting a garden or bouquet, since it often produces beautiful pale yellow-green, or purple, hues. Dahlias are bulbs, and during fall you can divide the tubers to increase your stock of the flowers. You can grow dahlias from seed. You might see seeds at garden centers, or in catalogs, as well as dahlia bedding plants. Dahlias bloom in color ranges from pink to purple and yellow to orange. They come in white, red, and even bi-colors. Use dahlias in gardens or bouquets along with annuals or perennials, as they mix quite well with both. Most dahlia plants grow to be anywhere from three to six feet, so they’re a nice flower to plant in the middle of a flower bed. If you plant dahlias around the border of a garden, and keep them trimmed low, you’ll easily locate the tubers for dividing. These are just some of the amazing things about the glorious dahlia. Do you love dahlias? If so, feel free to leave us comments about your experiences with the flower.